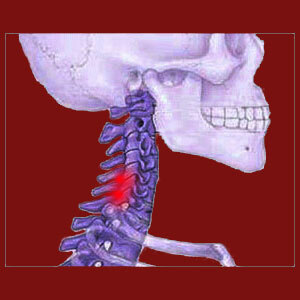 Cervical facet joint syndrome produces localized symptoms in the neck. The cervical zygapophyseal joints are very prone to mechanical dysfunction, since they suffer universal deterioration from age, activity and osteoarthritis. The incidence of severe disc desiccation is also very common in the neck, particularly in the mid to lower cervical spinal levels. This is definitely a contributory factor to the growth of arthritic activity in the neck of virtually every adult. Statistically, facet joint syndrome in the neck is most often diagnosed between C4 and T1, as these vertebrae move constantly and endure tremendous stress as part of their normal lives. However, some patients might demonstrate facet joint pathologies at the uppermost cervical levels, as well or instead of these usual locations. Regardless of where the facet joint symptoms occur, they can create mild to moderate pain in most scenarios, and severe pain is occasional instances, limiting physical functionality to a great degree. This essay explores cervical spinal facet syndrome. We will discuss why facet joint degeneration is normal in the neck and what processes contribute to the deterioration of the apophyseal structures. Furthermore, we will examine the symptoms of typical facet joint pathologies and how these can be used to aid in diagnostic evaluation of otherwise idiopathic neck pain. The cervical spinal region contains a total of 7 vertebral bones named C1 to C7. The uppermost vertebral bones, the atlas and axis, do not contain an intervertebral disc spacer and have specific properties that make them unique in the backbone architecture. Most facet joint deterioration is demonstrated by the middle and lower cervical levels, as well as at the juncture with the thoracic spine. These include the C4, C5, C6 and C7 levels as well as the cervicothoracic frontier of C7/T1. NUCCA chiropractic practitioners tend to focus much of their attention on the spinal joints of the uppermost vertebral bones. They theorize that misalignment of these bones is a major cause of a staggering array of problematic health issues. Objective medical research has not provided much credible evidence that atlas subluxation and upper cervical spinal joint alignment concerns are the cause of these conditions, but NUCCA continues to grow in popularity, regardless. The vertebral bones in the middle and low neck must work constantly to move the head and support its considerable mass through a diverse range of motion. All of this movement places tremendous stresses on the neck and leads to early degeneration of many of its tissues when compared to the thoracic spine. The cervical spinal discs tend to wear considerably by the age of 30 to 40. The osteoarthritic processes commence in earnest around the same age in most people, encouraging spondylitic spurring on vertebral bodies and on the facet joints. As the protective measures within the zygapophyseal joints wear away, the chances increase for symptomatic versions of facet degeneration to occur, particularly if the joints become hypertrophic. Similarly, since the bones move closer together, and the arthritic processes continue to act on the greater cervical anatomy, there is a good chance that the neural foramen will suffer a reduction in effective patency, potentially enacting one or more pinched nerves in the neck. When additional structural abnormalities exist in the cervical spine, the chances for symptomatic facet joint syndrome also increase, especially when these issues misalign the spinal bones and therefore also affect the apophyseal joints. The usual contributors include rare cervical spondylolisthesis, cervical scoliosis, hyperlordosis, hypolordosis and high level thoracic hyperkyphosis. Cervical facet joint syndrome mirrors the symptomatic activity of most other forms, with pain being expressed locally in each affected apophyseal structure and exacerbated by movement of the joint. Patients most often complain of pain upon neck movement in general or specific patterns. Pain will not usually exist off-center of the spinal column or radiate far from the affected joint. Instead, symptoms will be sharp and focused in the affected joint itself. The region will feel stiff and might feel hot. Pain is likely to diminish greatly when the area is rested and not mobilized. In circumstances where facet osteophytes are contributory to creating a compressive neuropathy due to foraminal stenosis, the patient will suffer an assortment of symptoms in the innervated location of the neck, upper back, shoulder, arm or hand. Pain and tingling will usually be the initial expressions, while numbness, weakness and dysfunction will be the longer-term results of symptomatic progression. Chronic pain is not typically a symptom of persistent nerve compression, so if this is the diagnosis (and it commonly is), patients are warned to be sure that symptomatic correlation is logical in order to prevent themselves from suffering the extremely common fate of misdiagnosis.